Mr Bush's body is due to lie in state this week ahead of a day of national mourning. 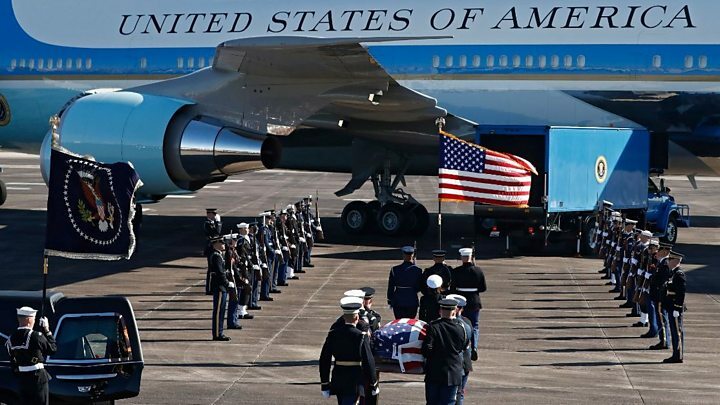 The coffin is being flown from Texas to DC on board Air Force One - temporarily renamed Special Air Mission 41, in homage to the late president - and then back on Wednesday, with Sully accompanying the body throughout. The picture was tweeted by Mr Bush's spokesman, Jim McGrath, showing Sully next to Mr Bush's casket on Sunday along with the caption: "Mission complete." What makes a one-term president? Sully is named after the airline pilot Chesley "Sully" Sullenberger, who landed a passenger jet on the Hudson River in 2009, saving all 155 passengers and crew on board. A highly trained dog, Sully can perform a number of commands, including opening doors and fetching items such as the phone when it rings. 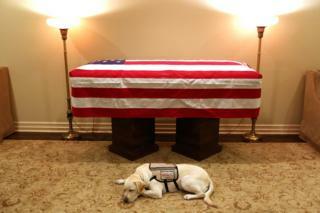 He will now work as a service dog, assisting with therapy for wounded soldiers. Sully has his own Instagram account; here he is shown "assisting with voting" as Mr Bush cast his ballot in last month's US presidential mid-term election. Not all US presidents have been fond of dogs, though: John F Kennedy was allergic to dogs, and Donald Trump does not have one. President Bush had been receiving treatment for a form of Parkinson's disease and had been admitted to hospital with a blood infection in April. He died in Houston, Texas. He will be buried at the presidential library in Texas, alongside his wife of more than 70 years, Barbara Bush, who died seven months ago. 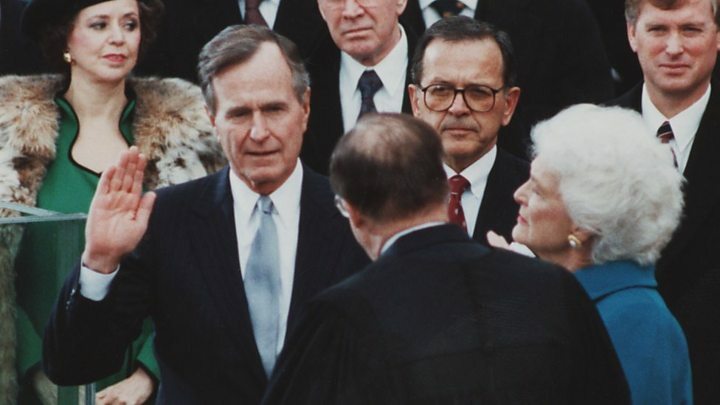 George HW Bush: What makes a one-term president?